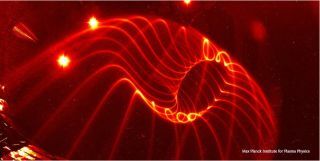 However, to achieve fusion, scientists must generate enormously high temperatures to heat the hydrogen into a plasma state. The plasma is so hot, in fact, that it would instantly burn material used to contain it. That's where the stellerator design comes in. The W7-X device confines the plasma within magnetic fields generated by superconducting coils cooled down to near absolute zero. The plasma — at temperatures upwards of 80 million degrees Celsius — never comes into contact with the walls of the containment chamber. Neat trick, that. The W7-X is the world's largest and most sophisticated stellerator and is currently operated by Max Planck Institute for Plasma Physics in Germany. But development of the W7-X has been an ongoing, international effort. The latest tests were conducted in collaboration with scientists from the U.S. Department of Energy's Princeton Plasma Physics Laboratory (PPPL). David Gates, principal research physicist for the advanced projects division of PPPL, leads the agency's collaborative efforts in regard to the W7-X project. In an email exchange from his offices at Princeton, Gates said the latest tests verify that the W7-X magnetic "cage" is working as planned. "This lays the groundwork for the exciting high-performance plasma operations expected in the near future," Gates said. In terms of the big-picture goal, Gates said that nuclear fusion reactors, if properly developed and deployed, would provide the planet with safe, clean and virtually inexhaustible energy. "The fuel source is found in seawater in quantities sufficient to last tens of thousands of years," he said. "The waste product is helium, an inert gas. A viable fusion reactor would provide a secure, plentiful and environmentally benign energy resource to all nations." That last part is critical. Gates said he's encouraged by fact that the W7-X project, and nuclear fusion research in general, is the result of close collaboration among scientists from around the world. 'Fusion is a problem best solved by the peoples of all nations working together, since the entire world will benefit from it."